When you want to save money on air travel, the first thing you need to decide is whether you’d prefer to fly with a Low Cost carrier (LCC) or, with a “full service” airline. If you prefer an LCC, click here for tips. For advice on finding the lowest fare with “full service” airlines, continue reading below. I recommend visiting ITA’s Matrix. Once there, select a “Month Long” search, enter your departure and destination cities, enter the earliest date you’re likely to travel, change the “Sales City” to be the same as the departure city, leave the other options as they are and click the “GO!” button. Matrix will then return the lowest fares found departing on any date during a 30 day period. 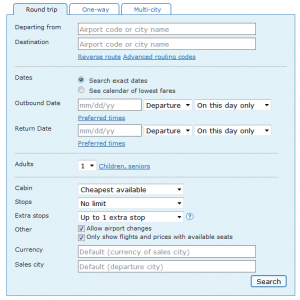 It’s not possible to actually book flights through this site, but it will give you a very good indication of the lowest published fares available, which you can then target nearer to the dates you actually want to travel. Sure it’ll take a little while to work through all the above, but you’ll likely find it’s worth it. Any registered trademarks mentioned on this site are the copyright of their respective owners.